The site is located on Barn Street in Stoke Newington. At the end of a dead-end street, and enclosed by post-war residential flats and a school, the site holds a central and strategic position within an urban block. 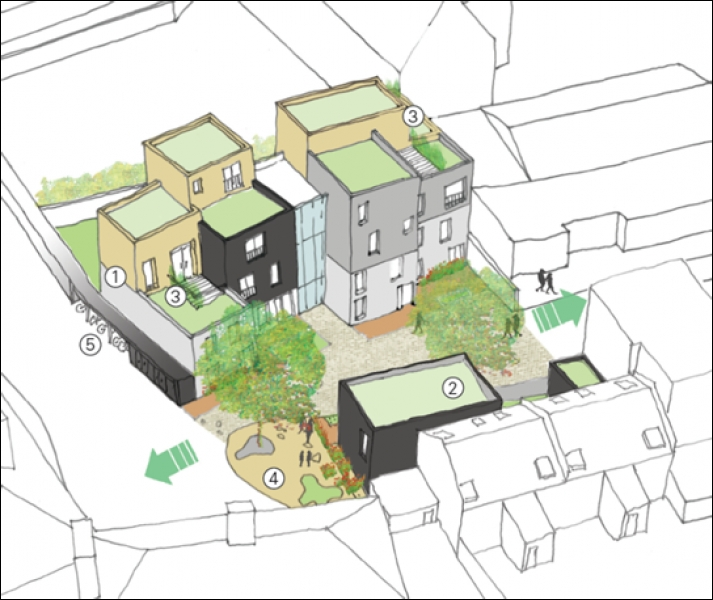 The scheme seeks to reinvigorate this area by proposing a nine unit development; creating a modern mews around a central landscape. The landscape is key to the scheme - organising its space and circulation, as well as connecting it to the post-war flats. This provides a heart and focus for the urban block and seeks to engage both the existing and future community. 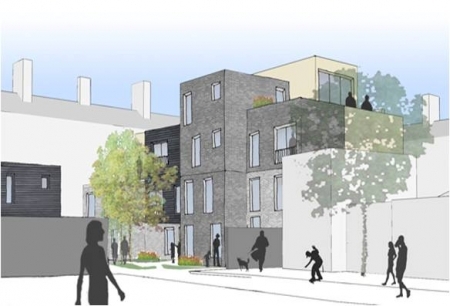 The nine units are divided into two buildings: a single family house with a garage, and a block of eight units comprising three three-bed maisonettes, four twobed duplex and a one-bed flat. The scheme contrasts the uniformity of the neighbouring post war flats emphasising the individuality of each dwelling - firstly through a split level floor plan which allows for open living; and secondly through a mix of materials to define each dwelling, giving a sense of ownership and a welcoming feel to each home. All the homes are double aspect, to allow for cross ventilation, and benefit from either a garden or a large roof terrace, providing high levels of comfort. The use of green roofs is also integrated for aesthetic and ecological benefits. Planning permission was obtained in November 2013.